Snowy owls are one of our largest owls and are fierce predators with large strong talons. They weigh about 3.5 pounds, and have a wingspan of 4.5-5.5 feet. As in most raptors, females are larger than males. They eat mostly rodents, but have been known to successfully take down prey as large as geese and great blue herons. Snowy owls are predominately white, but females and juveniles may have black streaking on body, belly, wings and head. Their eyes are golden. In their summer habitat on the artic tundra they hunt lemmings and other small rodents. Snowy owls are active during the day and thus are much easier for us to see than other owls which are nocturnal. Snowy owls are ground nesters. When juveniles reach their first winter, they tend to disburse and may fly far south to find suitable hunting grounds. They favor dunes and coastal areas that are much like their summer homes on the artic tundra. Snowy owls are nomadic. When birds migrate south in unpredictable numbers, this is known as an “irruption”. 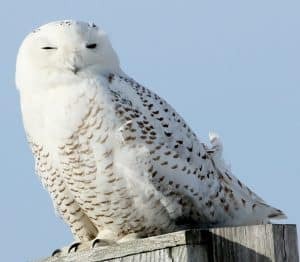 The winter of 2017-18 is said to be the largest irruption of snowy owls since 2013. It is not known exactly why the birds migrate south more in some years than in others. One theory is that they migrate south in search of food in years when the lemming population up north is low. Mass Audubon thinks that the migration may be caused by plentiful food at their nesting grounds in the summer, and a consequently larger than normal number of young being hatched. Some of these juveniles may then begin exploring new territory in the winter. Since 1997, Norm Smith of Mass Audubon has been catching and relocating owls found to have taken up residence at Logan Airport. Owls at the airport can cause a hazard for the planes. Smith releases the captured owls at Plum Island, Duxbury and Salisbury Beach. He attaches tiny transmitters to the feathers of some of those he releases, and then he is able to track them for a few months. When the animal molts, the transmitter falls off. For instance, Owl # 134376 was tracked from March 9, 2014-April 11, 2015. In March the animal was released on the north shore of Massachusetts. In April it traveled to southern Canada. In April and May it moved far north and summered in the upper Hudson Bay area where it presumably nested. It returned south again in November and December to southern Canada. You can see these fascinating migration maps; just Google Mass Audubon Snowy Owl Project. Many thanks to all flora and fauna reporters for the month of February. Please send reports by March 26 for inclusion in next month’s column. You can call me at 978-692-3907, write me at our new address 7A Old Colony Drive, Westford, or e-mail me at mariancharman@verizon.net. Dot Mooney, Monadnock Dr. January 24, At least sixteen juncos in for seed early evening, three male and two female cardinals. January 26, beautiful male flicker on deck with doves and blue jays. Flicker came to the shelled sunflower feeder for some quick energy. January 29, seventeen doves, joined by seven blue jays. January 31, a dozen juncos with a pair of cardinals and a few blue jays on deck. Rosemarie Koester, Providence Rd. January report: two pairs of blue jays, five cardinals, goldfinch, house finch, titmouse, chickadees, nuthatches, doves, lots of juncos, red-bellied woodpecker, white-throated sparrow, house sparrow, red-tailed hawk. Hearing coyotes again, sometimes one sometimes more, four gray squirrels, one lone chipmunk during warmer weather, deer racks in snow. Debbie Prato, Hayrick Lane. January 29, flicker, cottontail rabbit. Barbara Theriault, Tadmuck Lane. January 30, four adult and two young deer at edge of woods, cardinals, titmice, chickadees, juncos, woodpeckers at feeders. Kate Hollister, Vine Brook Rd. February 2, we enjoy watching a red and grey squirrel chase one another away form the feeder. Not seeing many birds. We mostly see juncos and titmice at feeder, an occasional chickadee, house sparrow and hairy woodpecker. Debbie Prato, Hayrick Lane. February 2, Canada geese, six mourning doves. February 4, six turkeys. February 7, first chipmunk. February 11, song sparrow. February 14, first red-winged blackbird. February 22, many robins, grackles and cowbirds. February 24, lots of cardinals and red-winged blackbirds, hawk with very dark head. Phil Day, Graniteville Rd. February 10, heard a whole family of coyotes howling and yipping at about 10:30 at night. Leslie Thomas, Old Colony Drive, February 9, coyotes howling near Chamberlain Rd. Marian/Bill Harman, Old Colony Drive. February 26, barred owl heard, crows, titmice, chickadees, white-breasted nuthatches, cardinal pair, downy woodpecker, hairy woodpecker, red-bellied woodpecker pair, at least six goldfinches, six juncos, flicker heard, crows heard, red-tailed hawk seen in meadow, two white-tailed deer bounding away, one red squirrel, two gray squirrels.